Only 10 years ago, when travellers would ask me to recommend them some Croatian souvenir, I’d say without much thinking „licitar heart” – which is a cute little item, but without much purpose. In recent years, I find it more difficult to reply to this same question, because the level of local souvenir shops has risen so much that it’s hard to recommend just one item. These shops have become places which design-loving locals like myself enjoy visiting too. 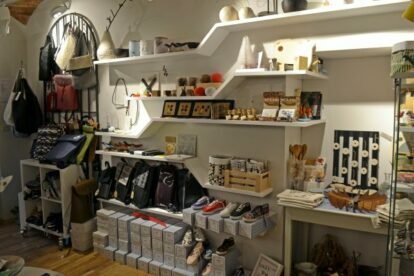 Among shops which sell quality Croatian souvenirs, Galerija Link is my favourite for its impressive array of beautifully designed items. It opened as mostly an antiquities shop around 20 years ago, but recently became oriented toward contemporary Croatian design. Here you can find wonderful ceramic items handmade by talented local artists, exuberant bags, funny creature-shaped cushions filled with lavender from Croatian islands, household items made of olive tree and of marble originated from Brač island, unusual textile vases and flower pots, a selection of the cult Startas shoes with playful patterns, made in limited edition for Galerija Link; and many other marvels. The staff are very helpful and enthusiastic to share the story behind each artwork. I enjoy coming here to browse the constantly changing offer and to admire the unique and creative items, which are not only decorative but also useful. Galerija Link is my first choice when I’m looking for a quality and original gift, but too often I can’t resist the temptation and end up buying something for myself too!